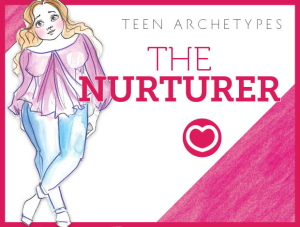 We are living in a new era in terms of the meaning of sexuality and self-definition, and teenagers are often the pioneers of these generational shifts in attitude. Even though the world is becoming more accepting of those of us who are gay, lesbian, straight, or transgendered, there are still many who prefer to live in between the lines and bravely choose not to identify with any color, gender, or sexuality. And oftentimes, during our teenage years of growth and self discovery, it is vital to release your inner Boy/Girl. 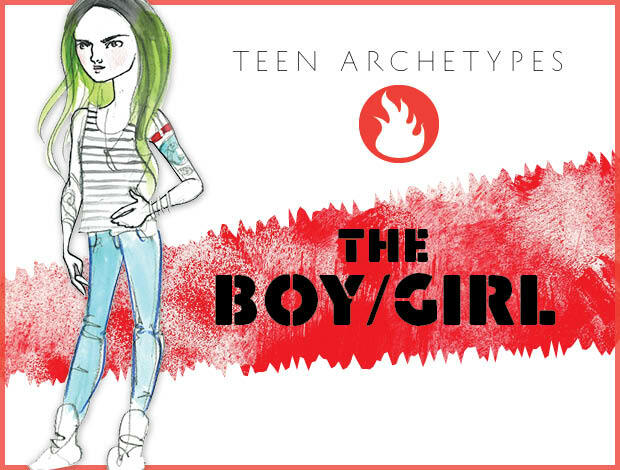 The Boy/Girl is often androgynous in appearance, and fearlessly unafraid to be who they are, no matter what the cost. They fall under the Rebel family because of their need to break the rules society imposes on them, but Boy/Girls can flourish under many different archetypal families, with connections to the Tomboy Athletes, Advocates, and Performers. Often great at shopping for clothes that can cross gender lines, with a unique sense of style. A solid group of truly accepting peers is the place where a Boy/Girl can feel most comfortable being who they are. Many Boy/Girls gravitate towards the arts, given their experiences learning how to live on both sides of the gender spectrum and their need for self-expression. They are happiest when living out these callings and often flourish during periods of transition and change. Many Boy/Girls love take the idea of self-creation into the realm of body modification, they may love tattoos, piercings, or changing their hair color to match their mood! Andrej Peijic, David Bowie, Joan Jett, Patti Smith, Tilda Swinton, Janelle Monae, Boy George, Marilyn Manson, Marlene Dietrich, Casey Legler, Jenny Shimizu. The Boy/Girl needs to surround themselves with people who understand that appearances are not what they seem—this often takes the smarts of an Intellectual, the strength of an Advocate, or the many different colors of Rebels, Creatives, and Performers. Because of their love of self-expression mixed so strongly with fearlessness, many Boy/Girls find themselves blending with Punks and Goths, but can just as easily hang with true Tastemakers who can see that style has no gender. Once a Boy/Girl finds someone they can trust who fully accepts their differences, they are very passionate and loyal. Oftentimes they are prepared to go to battle to defend their romantic relationships against others who would dare to raise an eyebrow—so be prepared to stand strong. As many Boy/Girls take great care to express themselves through their personal style, they often have deep attractions to others who do the same, no matter what gender they identify with. Boy/Girls oftentimes find themselves fighting many causes, because of the world’s pressure to identify as gay or straight, male or female. Many times, people make assumptions that can make a Boy/Girl angry or vulnerable to the attention of Bullies. It is dangerously easy to be drawn into starting a fight, or being the cause of unwanted attention or conflict—simply by existing. The mantra of being the bigger person has a particularly critical meaning to the Boy/Girl in distress. When confronted with ignorance in its many shapes and sizes, the Boy/Girl has to remember not to feed the beast, and fight the urge to fight back. Take a mental step back during a hostile situation, and try to remember that the people who may be trying to hurt you are oftentimes victims of their own circumstances, and are just afraid of what they don’t know. Take time to meditate when you have moments by yourself, and don’t be quick to anger when people ask you to explain yourself. It might feel exhausting, but telling people that you want them to get to know you based on what’s inside, and taking a path of compassion, can do more to illuminate ignorant minds than refusing to share the reasons you make the choices you do.